The McGuire’s team on site during a Habitat for Humanity “wall-raising”. From left, David Carr, Lisa Roselli, Andrea Ferrara and Frieda Toback. CHARLOTTE, NC 4/7/2008 – A team of hearing specialists from Long Island company McGuire’s Hearing and Audiological Services recently demonstrated that hearing care professionals do indeed make an important difference. The McGuires team joined hearing care professionals from across the country who volunteered to help construct a Habitat for Humanity home in Charlotte, NC that will benefit a deserving family. 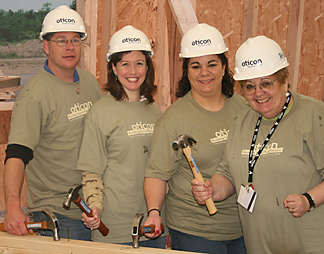 The wall-raising for the Habitat home, sponsored by leading hearing device manufacturer Oticon, Inc., took place during the annual convention of the American Audiology Association in Charlotte. McGuire’s representatives David Carr, Lisa Roselli, Frieda Toback, and Andrea Ferrara, joined dozens of others in helping construct the new home. Hearing loss is one of the most common health problems in the United States. It is estimated that over 28 million people, one in every ten Americans, has hearing loss. Hearing care professionals, like McGuire’s, provide a vital link to hearing health by evaluating hearing loss and helping individuals choose hearing solutions that suit their particular hearing loss. “Helping this family was a great opportunity for us to give back to others,” noted Carr. “It also gave us the chance to educate others about hearing health, which is always on our radar screen,” he added. McGuire’s Hearing and Audiological Services has offices in Riverhead, Southampton, Patchogue, Greenport and Montefiore Medical Center in the Bronx. For more information on hearing health and hearing solutions, contact McGuire’s at 1-866-447-5115 or visit www.mcguireshearing.com.